M ost African slaves came from the west coast of Africa. They came, chained two by two, left leg to right leg, from a thousand villages and towns. They came from many racial stocks and many tribes, from the spirited Hausas, the gentle Mandingos, the creative Yorubas, from the Ibos, Efiks and Krus, from the proud Fantins, the warlike Ashantis, the shrewd Dahomeans, the Binis and Sengalese. Slaves were purchased from brokers at the forts and factories or in open markets. 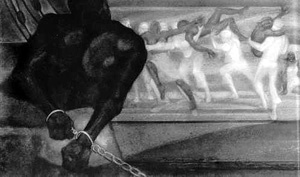 The newly-purchased slaves, properly branded and chained, were rowed out to the slave ships for the dreaded Middle Passage across the Atlantic. They were packed like books on shelves into holds which in some instances were no higher than eighteen inches.